I’m not sure where the time goes, but Jellybean is already two months old! When parents say “kids grow up so far”, they seriously weren’t kidding. Not only is my maternity leave flying by, but JB is getting bigger, stronger and (of course) cuter by the day. Before Jellybean arrived I spent a good amount of time preparing for her birth. Decorating her nursery was just as important to me as purchasing the necessities. All in all we were very well prepared for Jellybean – as far as “stuff” goes … the whole sleep deprivation thing … NOT so much! 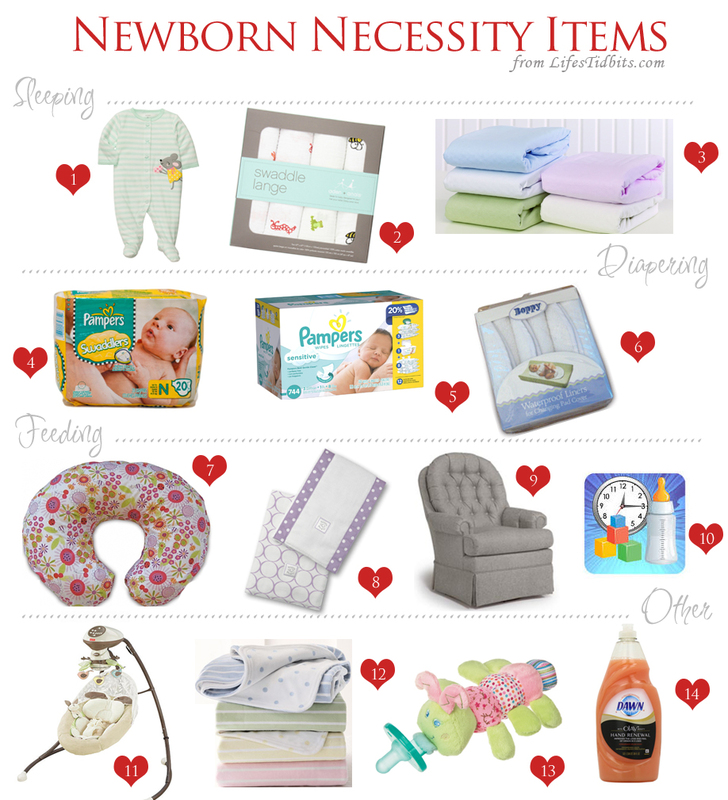 Over the past two months the husband and I quickly identified our must have and necessary items for a newborn. While it is similar to my pre-baby/pregnancy registry must have list this one is bigger and more accurate. 1 – Since JB is a winter baby warm onesies with feet on them (as recommended by my mother) are essential. I would highly recommend purchasing at least 5 and get the button ones over the zip-up onesies. While I know many folks swear by the zip-ups as they are easier the buttons come in handy during those 3am diaper changes. Unzipping the whole onesie makes our baby colder (and often more cranky) than quickly unbuttoning just the legs and tush areas. 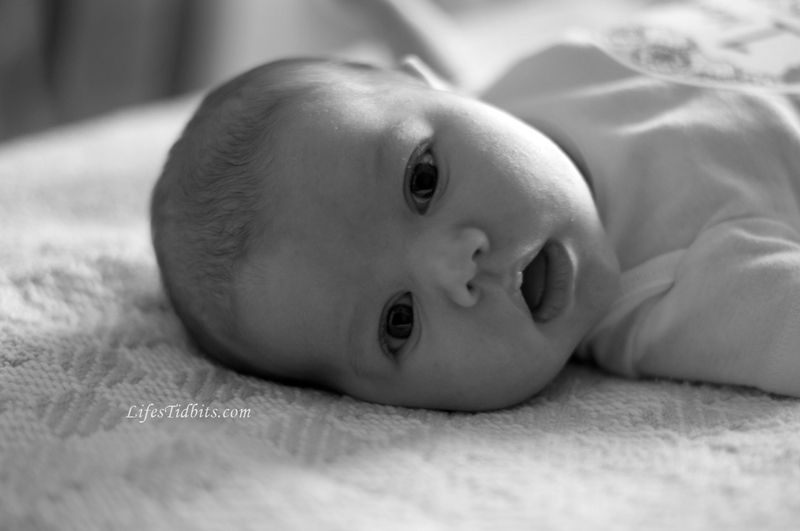 2 – I had originally planned on using swaddle pods, however my baby HATES them. We are talking blood curdling screams as we zipped her into them. We quickly learned that while she absolutely wants to be swaddled she wants the old school method. The aden + anais Muslin Swaddle Blankets are perfect. They are big and enable even the worst of swaddlers (read me … my husband is the swaddle pro!) to wrap the blanket around and get a tight swaddle. 3 – I figured 1 bassinet sheet would be plenty… HA! Amateur I tell you – AMATEUR. Between spit up, regular linen changes and oh yes a couple of diaper blow outs having extra bassinet sheets was extremely helpful (thanks mom!). 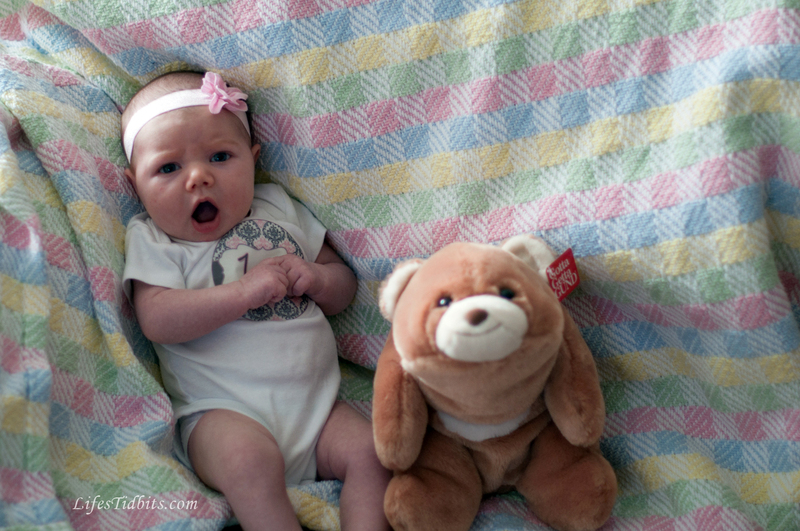 4/5 – We tried Huggies and Pampers Swaddles with Jellybean was first born. I must say we had less blow outs/leaks with the Pampers Swaddlers. Like a mentioned before I’m shocked at the shier volume of diapers and wipes we go through. STOCK UP before the baby comes or consider Amazon Mom, it saved us on more than one occasion. 6 – I would recommend getting a bunch of these. They come in more handy than I thought they would and save me from having to wash the changing pad cover as often. It’s almost as though Jellybean knows when I’ve removed the old diaper and I’m starting to put the new one on and BAM in the 30 second switch she pees hahaha. Instead of taking the whole cover off I just quickly switch out the liner and I’m back in business. 8 – Although pretty burp cloths are definitely nice to have it is best to have a lot. I’ve also found thicker burp clothes are better to help absorb any of those bigger spit ups which leak through the thin cloths. My mom suggested we buy these , which are both affordable and thick. 9 – I spent the first few days at home attempting to find the best location for nursing. I sat on the couch, the big chair in the living room, the glider and even tried breastfeeding in bed (worst place of all!). I found the glider to be the easiest and most comfortable place to breastfeed. There is a learning curve with breastfeeding (at least there was for me) and being able to sit comfortably and have good support for both my back and arms made the process a little bit easier. 10 – After leaving labor/delivery and getting somewhat settled into our recovery room the nurse handed us a sheet of paper. She explained that all feedings as well as pee/poppy diapers should be tracked. Given how exhausted we both were the idea of writing all the down seemed like a lot of work. I quickly remembered my neighbor had recommended an app, which made tracking everything easier. I downloaded the trial version and got to tracking. The app is user friendly and my favorite part is you can pause and resume feedings as necessary. I rarely pay for apps for my phone, but this one was well worth the money! 11 – Originally I was against spending this kind of money on a swing not to mention it is pretty big and we live in a condo and have limited space! When I figured out Jellybean like to swing side to side and not front to back I started toying with the idea of buying this swing. The hubby’s work friends gave us a gift certificate to Babies R’ Us which just about covered the cost of the swing. After a little push from my parents off to the store we went. Jellybean takes a ton of naps in the swing…it’s definitely a MUST HAVE! 12 – These blankets are great for cuddling on the couch or keeping baby warm while traveling from one destination to another. And let’s not forget how incredibly soft these blankets are as well!! 13 – This pacifier is not only cute, but practical. The toy part lays on the baby’s chest or you can prop it up in the swing so the pacifier doesn’t pop out of his/her mouth as easily. Makes for less getting up and down to pop the pacifier back in…winning! 14 – So has your baby had a blow out yet? Well let me tell you when it happens it is GROSS. What’s worse is trying to get the poop color out of the clothes (and/or whatever the poop got on). Oddly enough the thing we’ve found that works the BEST is dish soap. I have no idea what the difference is between the dish soap and baby oxiclean and/or dreft, but a little dish soap and warm water and we say goodbye to the stain! Obviously after we get the stain our we run it through the wash using dreft so the clothes don’t irritate Jellybean’s skin. 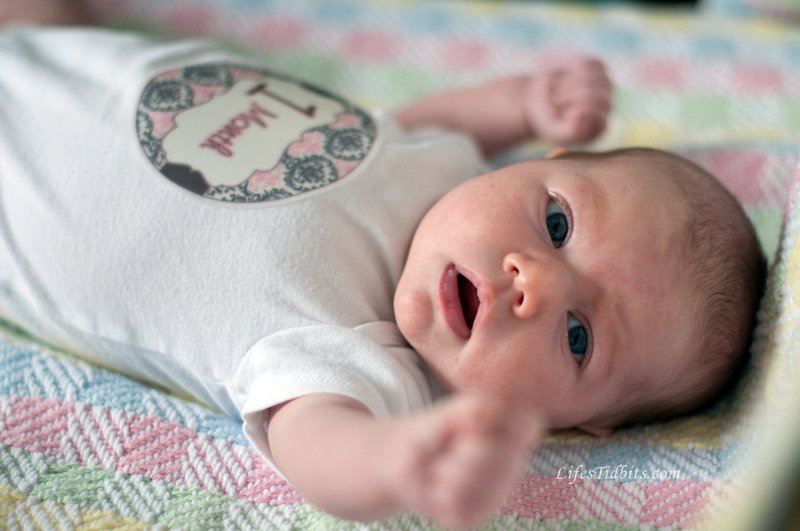 So there you have it – my pretty robust must have list for a newborn. What items couldn’t you live without having a newborn/infant in the house? While the pregnancy series has come to a close the baby series is just beginning! I must admit there is a small portion of me that misses blogging about being pregnant. That being said I might have a few “reflection” posts in my back pocket should the mood strike. In any event, it has been a WHOLE month since Jellybean made her grand entrance. I am not sure where the past 4 weeks have gone. The days seem to fly by. I’m not really sure what, if anything, I actually do all day. My day revolves around feedings, diaper changes, soothing and trying to get baby girl to sleep. There is no routine to speak of, yet. I am looking forward to getting Jellybean (and myself) on a routine, however her eating “on demand” doesn’t lend itself well to a schedule. We will get there eventually … as the pediatrician told me there is no need or rush to get her on a set schedule at this point. On her one month birthday we did a little photo shoot to document the occasion. Love how her fist is reaching for the camera! Not consistently :) Jellybean is sleeping anywhere from 2 to 4 hours during the night (9pm to 8am). I’m unable to identify what factors influence how many hours she sleeps for, but I very much appreciate the 4 hour stints! At this point we are exclusively breastfeeding. She eats every 1.5 to 2.5 during the day. We have had a few days when we think she had a growth spurt and all she wanted to do was eat every 45 minutes to an hour. It was very exhausting! Much to my surprise she is still in newborn diapers. After a couple of diaper blowouts we tried upping her to size 1, however they were just way too big on her so we went back to the newborn size. Despite being told countless times by other moms I’m completely shocked at pure number of diapers we go through each week!! Jellybean is currently wearing newborn and size 0-3 month clothing. It was only the past couple days where she wasn’t swimming in her 0-3 month clothes. The newborn clothes are starting to get a little small so we will be transitioning to all 0-3 month clothes soon I expect. Jellybean can already lift her head … she’s so strong for such a little person! Though it looks like she has control over her head for a few second she then looses it and her head comes crashing down onto my chest. Despite her ability to lift her head tummy time only lasts a minute or two before she gets agitated. Jellybean is also incredibly alert. She’s drawn to bright light and often stares intensely at something for a good amount of time. Now what she’s actually looking at (unless it is directly at me) is sometimes hard to tell. Those are two of my favorite pictures from her one month photo shoot! I would love to know what she is thinking in the second picture. She’s almost like “are you done yet mom? I know I’m cute, but let’s get this over with already.” Hahaha. What was your favorite tidbit from your baby’s first month?